A new exhibit at the Seacoast Science Center in Rye, New Hampshire, gives visitors an opportunity to peer into the depths of the complex marine ecosystem of the Gulf of Maine like a scientist and learn about the underwater web of life that ebbs and flows through the entire year. "Seasons of the Sea" is a hands-on display created by the collaboration of University of New Hampshire marine scientists and Seacoast Science Center staff using National Aeronautics and Space Administration and Gulf of Maine Ocean Observing System data sources. The exhibit uses current scientific data from ocean observing tools like high-tech buoys and satellites to illustrate the year-long inner workings of the Gulf of Maine's unique character. For example, two buoys, one in the coastal zone and one far offshore in deep waters, send live data to a six-foot buoy display. Viewers can compare data from the two buoys--water temperature and salinity levels at the surface and deep below, wind speed and air temperature, current speed and direction--and put in updated information on dials that accompany the display. 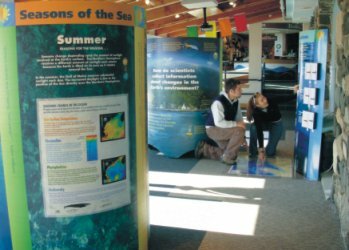 Informational kiosks provide details on each of the underwater seasons, and large floor maps of the Gulf of Maine orient viewers and show the locations of the dozen science and meteorological buoys that pepper the waters. The Seacoast Science Center is open from 10:00 a.m. to 5:00 p.m. Saturday through Monday. To learn more call (603)436-8043.